Department of Biochemistry and Molecular Biology, Colorado State University, Ft. Collins, Colorado. Abstract. The pH-responsive stabilization of the rat renal glutaminase (GA) mRNA during metabolic acidosis is mediated by a pH-response element (pH-RE). The primary pH-RE within the GA mRNA consists of a direct repeat of an 8-base adenosine and uridine—rich sequence, which binds a specific cytosolic protein, the pH-response element binding protein (REBP). The functional analysis of this system was performed in LLC-PK1-F+ cells, a pH-responsive line of porcine proximal tubule-like cells. Cytosolic extracts of LLC-PK1-F+ cells also contain a protein that binds with high affinity to the rat GA mRNA pH-RE. The apparent binding of this protein is increased threefold in cytosolic extracts prepared from LLC-PK1-F+ cells that were grown in acidic medium (pH = 6.9, HCO3- = 10 mM). Extracts prepared from the renal cortext of rats that were made acutely acidotic also exhibit a similar increase in binding to the RNA probe that contains the direct repeat of the pH-RE. The temporal increase in binding correlates with the temporal increase in GA mRNA. Scatchard analysis indicates that the increased binding is due to an increase in both the affinity and the maximal binding of the pH-REBP. Thus, increased binding of the pH-REBP to the GA mRNA may initiate its stabilization and increased expression during acidosis. The increased renal synthesis of ammonium and bicarbonate ions from plasma glutamine is an essential compensatory response to the onset of metabolic acidosis (1). Increased renal excretion of ammonium ions provides an expendable cation that facilitates the excretion of acids while conserving sodium and potassium ions (2). In contrast, the resulting bicarbonate ions are selectively transported across the basolateral membrane to compensate partially for the decrease in plasma pH and bicarbonate ions (3). During chronic acidosis, the increased catabolism of glutamine within the rat kidney is sustained, at least in part, by the cell-specific induction of the mitochondrial glutaminase (GA). This activity is increased 7-to 20-fold, but only within the S1 and S2 segments of the proximal convoluted tubule (4,5). An increased rate of GA synthesis (6) is mediated through a corresponding increase in the levels of the GA mRNA (7,8,9). However, data from transcription runoff experiments indicated that the increase in GA mRNA does not result from an increased rate of transcription of the GA gene (8,9). More recent studies have established that the induction of the rat renal GA during metabolic acidosis is due to a selective increase in the stability of the GA mRNA. This response was initially demonstrated by stable transfection of LLC-PK1-F+ cells, a pH-responsive line of porcine proximal tubule-like cells (10), with a transgene that encodes a chimeric β-globin mRNA (11). With the use of this system, it was possible to demonstrate that a 956-base segment that corresponds to the 3′-nontranslated region of the 3.4-kb GA mRNA was sufficient to impart a pH-responsive stabilization to a nonresponsive reporter mRNA. This approach was also used to map the primary pH-response element (pH-RE) to a 340-base segment and to demonstrate that redundant but weaker elements are contained in other segments of the 3′-nontranslated region of the GA mRNA (12). RNA gel-shift analyses were used to demonstrate that the 340-base segment of the GA mRNA binds with high affinity and specificity to a unique 48-kD protein that is present in cytosolic extracts of rat renal cortex (12). This binding interaction was then mapped to a direct repeat of an 8-base adenosine and uridine (AU)-rich sequence. The same protein also binds with lower affinity to two additional segments derived from the 3′-nontranslated region of the 3.4-kb GA mRNA. Each of the latter segments contains a single 8-base AU-rich sequence that has a high degree of homology to the individual elements within the high-affinity binding site. More recent mutational analysis and functional studies (13) have established that a single copy of the 8-base AU-rich sequence is both necessary and sufficient to function as a pH-RE. In the current study, cytosolic extracts of LLC-PK1-F+ cells were also shown to contain a protein that binds with high affinity to the identified pH-RE. Furthermore, the apparent binding interaction of the pH-RE binding protein (pH-REBP) was increased in cytosolic extracts prepared from LLC-PK1-F+ cells that were treated with acidic medium or from the renal cortex of rats that were made acutely acidotic. Scatchard analysis of the latter extracts demonstrated that the observed increase in binding resulted from an increase in both the affinity and the maximal binding of the pH-REBP. These results suggest a potential model of the mechanism by which this specific binding interaction could lead to stabilization of the renal GA mRNA. [α-32P]UTP (specific activity 3000 Ci/mmol) was purchased from ICN Biomedical Research Products (Costa Mesa, CA) or Amersham Pharmacia Biotech (Piscataway, NJ). T7 RNA polymerase, RNase T1, and yeast tRNA were products of Boehringer Mannheim (Indianapolis, IN) and New England Biolabs (Beverly, MA). RNAsin was acquired from Promega (Madison, WI). DMEM/F12 medium was from Life Technologies-Gibo/BRL (Rockville, MD). Tissue culture plates were obtained from Corning Science Products (Acton, MA). All other biochemicals were purchased from Sigma (St. Louis, MO). Rats were made acutely acidotic by stomach-loading them with 20 mmol NH4Cl per kilogram of body weight. Cytosolic extracts of the renal cortex were prepared as described previously (12). LLC-PK1-F+ cells (10) were obtained from Gerhard Gstraunthaler and cultured in a 50:50 mixture of Dulbecco's modified Eagle's and Ham's F12 media containing 5 mM glucose and 10% fetal bovine serum at 37°C in a 5% CO2 atmosphere. Normal medium (pH 7.4) contained 25 mM sodium bicarbonate, whereas acidic medium (pH 6.9) contained 10 mM sodium bicarbonate and was supplemented with 15 mM sodium chloride to maintain an equivalent osmolarity and sodium ion concentration. LLC-PK1-F+ cells were cultured on 10-cm plates for 10 to 12 d. The cells were washed twice with ice cold phosphate-buffered saline solution and then lysed at 4°C by addition of 0.5 ml of lysis/extraction buffer containing 10 mM N-hydroxyethylpiperazine-N1-2-ethanesulfonic acid, pH 7.4, 3 mM MgCl2, 40 mM KC1, 2 mM DTT, 5% glycerol, 0.5% Nonidet NP-40, 8 μg/ml aprotinin, 10 μg/ml phenylmethylsulfonyl fluoride, 10 μM leupeptin, and 10 μM antipain. The cells were scraped from the plate, collected into a 1.7-ml microcentrifuge tube, and kept on ice. The cells were then vortexed briefly two or three times over a period of 15 min. Nuclei and cell debris were removed by centrifugation at 10,000 × g for 15 min at 4°C. The supernatants were subsequently centrifuged at 100,000 × g for 30 min at 4°C. The resulting cytosolic fraction was aliquoted and stored at -70°C until used. The protein concentrations of the cytosolic fractions were determined by the method of Lowry et al. (14) using bovine serum albumin as the standard. The template used to transcribe the R-21 was obtained by digesting the pBS-GA(R-21) plasmid (12) with the restriction enzymes BssHII and XbaI. The DNA template was resolved on an 8% acrylamide gel and eluted by the method of crush and soak (15). In vitro transcription was performed using a slight modification of a previously described method (16). The radioactivity of the final product was determined by scintillation counting, and the concentration of the labeled RNA was determined from the specific radioactivity of the incorporated [α-32P]UTP. The concentrations of unlabeled RNA were determined by measuring the absorbance at 260 nm and by using specific extinction coefficients calculated from the nucleotide composition of the individual transcripts. All transcripts were stored at -70°C and used within 3 to 4 d.
The RNA electrophoretic mobility shift assay was developed by introducing slight modifications to a previously described procedure (17). An aliquot of a rat renal cortical extract containing 3 μg of protein was preincubated for 10 min at room temperature with 0.5 μg of yeast tRNA in 10 μl of a reaction mixture containing 10 mM N-hydroxyethylpiperazine-N1-2-ethanesulfonic acid, pH 7.4, 25 mM potassium acetate, 2.5 mM magnesium acetate, 0.5% Nonidet P-40, 10% glycerol, 1 mM dithiothreitol, and 10 U RNAsin. Then [32P]-labeled RNA and specified amounts of unlabeled RNA were added as indicated. The reaction mixture was incubated at room temperature for 20 min. Time course studies established that this incubation was sufficient for the RNA binding to reach equilibrium (data not shown). The samples were then loaded onto a 5% polyacrylamide gel and subjected to electrophoresis at 170 V using a 90-mM Tris, 110-mM boric acid, 2-mM EDTA running buffer. This method of separation has been used extensively to quantify the amount of bound and unbound ligand in both RNA and DNA binding studies (18,19). After electrophoresis, the gels were dried and exposed to a PhosphorImager screen (Molecular Dynamics, Piscataway, NJ). The previous experiments that identified and characterized the function of the pH-RE of the rat renal GA mRNA were performed in LLC-PK1-F+ cells (11,12). The observed responses suggest that these cells must express a protein that functions similarly to the pH-REBP that is expressed in rat renal cortex (12). Thus, RNA gel-shift assays were performed to compare the ability of the pH-RE to bind to specific proteins in cytosolic extracts of rat renal cortex and of LLC-PK1-F+ cells (Figure 1). A single band was observed when the R-21 probe, a 29-base segment that contains the direct repeat of the pH-RE, was incubated with normal rat cytosolic extracts. The addition of RNAsin to the rat cytosolic extract was sufficient to protect the unbound RNA probe from degradation by endogenous RNAses. Cytosolic extracts prepared from LLC-PK1-F+ cells grown in normal medium (pH 7.4) also produce a single band when incubated with the R-2I probe. However, the observed RNA/protein complex has a slightly slower mobility than the complex that is formed with rat renal extracts. Furthermore, the intensity of this band was increased threefold by using an equivalent amount of protein obtained from cells treated with acidic medium (pH 6.9). However, the addition of RNAsin or other RNAse inhibitors was not sufficient to prevent significant degradation of the unbound RNA probe in extracts of the LLC-PK1-F+ cells. Detection of pH-response element binding protein (pH-REBP) in cytosolic extracts of LLC-PK1-F+ cells. Three μg of bovine serum albumin (BSA), 2 μg of a normal rat cytosolic extract (NRC), or 2 μg of cytosolic extracts from LLC-PK1-F+ cells that were either maintained in normal medium (pH 7.4) or treated with acidic medium (pH 6.9) for 24 h were incubated with [32P]-labeled R-2I RNA. The RNA/protein complexes were resolved on a nondenaturing polyacrylamide gel. The gel was then dried and exposed to a PhosphorImager screen. An equivalent amount of [32P]-labeled R-2I probe was added to each sample shown in Figure 1. However, the majority of the probe recovered from the samples incubated with the cytosolic extracts of LLC-PK1-F+ cells was degraded. In addition, the amount of intact free probe recovered in the samples incubated with extracts from LLC-PK1-F+ cells that were grown in acidic medium was always greater than that observed using extracts from cells grown in normal medium. Thus, the LLC-PK1-F+ cells express a cytosolic protein that binds to the pH-RE derived from the 3′-nontranslated region of the GA mRNA. However, given the significant extent of degradation and the differential recovery of intact probe, it was not possible to assess definitively the significance of the apparent difference in binding observed with the extracts of the LLC-PK1-F+ cells. Cytosolic extracts were prepared from the renal cortex of normal rats and of rats that were made acutely acidotic for 2, 8, and 18 h. The apparent binding of the [32P]-labeled R-2I probe to cytosolic proteins from normal and acutely acidotic rats was then compared (Figure 2). The [32P]-labeled R-2I probe produced a significant shift when incubated with 1.0 μg of the normal cytosolic extract. Previous experiments have established that this shift represents the specific interaction of the R-2I probe with a unique 48-kD protein (12). The intensity of this band was unchanged when an equal amount of extract from 2-h acutely acidotic rats was used. However, the intensity of the shifted band increased significantly (threefold) when extracts from rats that were made acutely acidotic for 8 and 18 h were tested. Effect of acute metabolic acidosis on the apparent binding of rat renal cortical cytosolic extracts to the pH-RE. Either 1 μg of BSA (lane 1) or 1 μg of cytosolic protein contained in renal cortical extracts from a normal (N) rat (lane 2) and from rats made acutely acidotic (A) for 2, 8, or 18 h (lanes 3 to 5) were incubated with [32P]-labeled R-2I RNA. The RNA/protein complexes were resolved on a nondenaturing polyacrylamide gel. The gel was then dried and exposed to a PhosphorImager screen. Scatchard analysis was performed to compare the dissociation constant (KD) and maximum binding (Bmax) of the pH-REBP expressed in the renal cortical extracts of normal versus acidotic rats. Cytosolic extracts containing 1 μg of protein from normal and 18-h acutely acidotic rats were incubated with 40 fmol of [32P]-labeled R-2I probe. 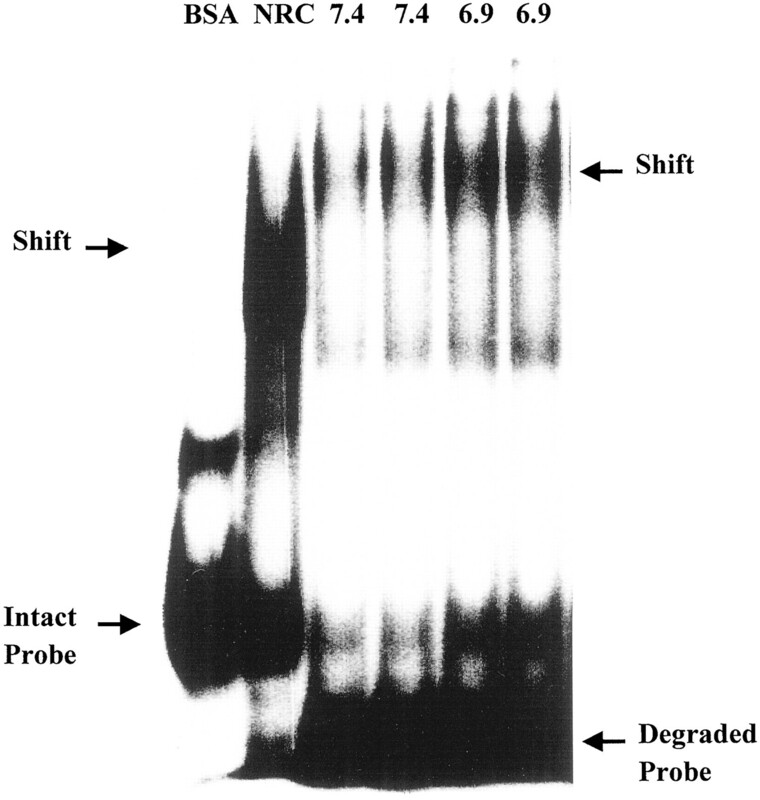 With the normal extracts, approximately one third of the labeled probe was bound to the pH-REBP. However, with the acidotic extracts, approximately two thirds of the probe was bound (Figure 3). With both samples, competition of the shifted band became evident when the amount of the unlabeled probe was increased threefold. The intensity of the shifted band continued to decrease as the amount of cold probe was increased. RNA gel-shift analyses of the effect of metabolic acidosis on the binding properties of the pH-REBP. Aliquots of cytosolic extracts prepared from the renal cortex of a normal rat or a rat that was made acutely acidotic for 18 h and containing 1 μg of protein were incubated with 40 fmol of [32P]-labeled R-2I. The incubations were repeated in the presence of increasing amounts (3-, 5-, 8-, 12-, 20-, and 30-fold excess) of unlabeled R-2I RNA. The RNA/protein complexes were resolved on nondenaturing polyacrylamide gels. The gels were dried and exposed to a PhosphorImager screen. The presented data were derived from one of three independent experiments. The relative intensities of the bands that correspond to the bound and free probes were quantified by Phosphorlmager analysis. These data along with the knowledge of the concentration of total probe in each sample was then used to calculate the concentrations of bound and free probes. Scatchard analysis was performed by plotting the amount of bound/free probe against the nanomolar concentration of free probe present in the reaction. Linear regression analysis of the plotted data was performed (Figure 4). For this experiment, the calculated KD values for the pH-REBP in extracts from normal and acidotic rats were 37 nM and 20 nM, respectively. The corresponding Bmax (which indicates the maximal binding sites) were 19 and 40, respectively. In total, the values of the two constants were determined using separate renal extracts prepared from three normal and three acidotic rats. The mean ± SD of the KD values from the three separate experiments was 32.5 ± 2.5 nM and 21.3 ± 4.6 nM for the binding proteins contained in extracts of normal and acidotic rats, respectively. These values are indicative of an increased binding affinity of the protein extracted from the kidney of an acidotic rat. The mean ± SD of the Bmax values determined from the same three experiments was 15.2 ± 6.2 and 30.5 ± 9.8 nM for the cortical extracts from the kidney of normal and acidotic rats, respectively. Thus, acidosis seemingly affects both the affinity and the maximal binding of the pH-REBP. Scatchard analyses of the binding properties of the pH-REBP contained in cytosolic extracts prepared from the renal cortex of normal and acutely acidotic rats. The relative intensities of the bands shown in Figure 3 were quantified using Image Quant software (Molecular Dynamics), and the ratio of bound over free [32P]-labeled R-2I probe was plotted against the concentration of free probe present in each sample. The plotted data were derived from one of three independent experiments. Multiple GA mRNA that contain different 3′-nontranslated regions are expressed in LLC-PK1-F+ cells (20). Recent studies indicate that the levels of only the 4.5-kb porcine GA mRNA are increased when the LLC-PK1-F+ cells are transferred to acidic medium and that this increase results from a stabilization of the mRNA (21). Thus, one would predict that the 3′-nontranslated region of the 4.5-kb porcine GA mRNA contains a pH-RE. Unfortunately, this segment of the 4.5-kb GA mRNA has not, as yet, been cloned and sequenced. On the basis of the results of the functional studies, one would also predict that cytosolic extracts obtained from LLC-PK1-F+ cells must contain a pH-REBP that has a specificity similar to the binding activity observed in cytosolic extracts of rat renal cortex. Using the 29-base R-2I transcript, such a binding activity was readily detected. Furthermore, the apparent binding of this protein was increased in cytosolic extracts obtained from LLC-PK1-F+ cells that were maintained in acidic medium. This result suggests that increased binding of the pH-REBP may contribute to the increased stability of the endogenous 4.5-kb porcine GA mRNA and to that of the various transgenic mRNA that contain the rat pH-RE. Very similar results were observed with the use of extracts prepared from the renal cortex of rats that were made acutely acidotic. Furthermore, the adaptive increase in binding activity occurred with kinetics that are consistent with the induction of the GA mRNA. After onset of acidosis, the increase in the level of the GA mRNA in rat renal cortex is initiated after a 6- to 8-h lag and it reaches a new steady state by 18 to 20 h (8). With the use of the R-2I RNA probe, there is no observable increase in the binding to the pH-RE within 2 h after administration of a bolus of NH4Cl. However, within 8 to 18 h after onset of acidosis, the binding activity was increased threefold. Thus, the initial lag in increasing binding activity could account, at least in part, for the lag in the increase in GA mRNA levels. Scatchard analyses of the binding properties of the renal pH-REBP extracted from normal and acidotic rats revealed significant differences in both the KD and Bmax values (Figure 4). The KD of the pH-REBP obtained from normal and acidotic rats was 32.5 ± 2.5 and 21.3 ± 6.2 nM, respectively. Thus, an increased affinity contributes only slightly to the greater binding observed in cytosolic extracts obtained from acidotic rats. The observed changes in Bmax values indicate that either the steady state level or the formation of an activated form of the pH-REBP is increased twofold after onset of acidosis. Thus, additional studies will be required to determine whether the increased affinity of the pH-REBP obtained from acidotic rats reflects the end product of a unique signal transduction pathway or the result of increased synthesis. Such studies will be greatly facilitated by the purification and cloning of the rat renal pH-REBP. The pH-REBP may protect the GA mRNA from degradation by RNases. Increased binding would enhance stability by increasing the half-life of the GA mRNA. This model is similar to that previously proposed (22) to explain how a destabilizing element within the 3′-nontranslated region of the transferrin receptor mRNA serves as a nuclease recognition site. Changes in cellular iron concentration affect the affinity of an iron-REBP. Increased binding blocks the activity of a site-specific endonuclease and prevents the decay of the transferrin receptor mRNA. Similar models have been proposed for RNA-binding proteins that regulate the expression of mRNAs encoding transport proteins such as the glucose transporter 1 mRNA (23) and the Na+/coupled glucose transporter (24). The stability of the two mRNA is increased after treatment with tumor necrosis factor α and adenosine 3,′5′-cyclic monophosphate, respectively. In both cases, the increases coincide with an increase in the binding of a cytosolic protein to the 3′-nontranslated region of the respective mRNA. Thus, the cumulative data are consistent with the following model (Figure 5). In normal acid-base balance, the instability element present in the 3′-nontranslated region of the GA mRNA is unprotected and exhibits a rapid turnover. The onset of metabolic acidosis causes an increase in the binding affinity of the cytosolic pH-REBP solely within the cells of the proximal convoluted tubule. This, in turn, confers increased protection to the GA mRNA from nucleolytic attack and results in an increased stabilization of the GA mRNA. This hypothesis represents the simplest interpretation of the available data. However, the data presented in these studies do not rule out a more complex mechanism. Further elucidation of the system will require the purification and cloning of the pH-REBP. Proposed model for the mechanism by which the onset of metabolic acidosis leads to a stabilization of the renal GA mRNA. The 8-base adenosine and uridine—rich pH-RE serves as a binding site for the pH-REBP and to recruit a specific endoribonuclease. In normal acid-base balance, the weak binding of the pH-RE allows for the more rapid initiation of degradation of the GA mRNA. However, during metabolic acidosis, the increased binding of the pH-REBP blocks recruitment of the endoribonuclease and leads to stabilization of the GA mRNA. This research was supported in part by National Institutes of Diabetes and Digestive and Kidney Diseases Grant DK-37124 awarded to N. P. Curthoys.